Clearly I was heavily influenced by the sci-fi movies of the 1970’s and 80’s. It was movies like ‘The Thing’ and ‘Close Encounters of the Third Kind’ that sparked my love of cinematography and photography without me even realizing it at the time. Wherever I go, I’m always searching for that ‘atmosphere’ and I try hard to capture it in my work. 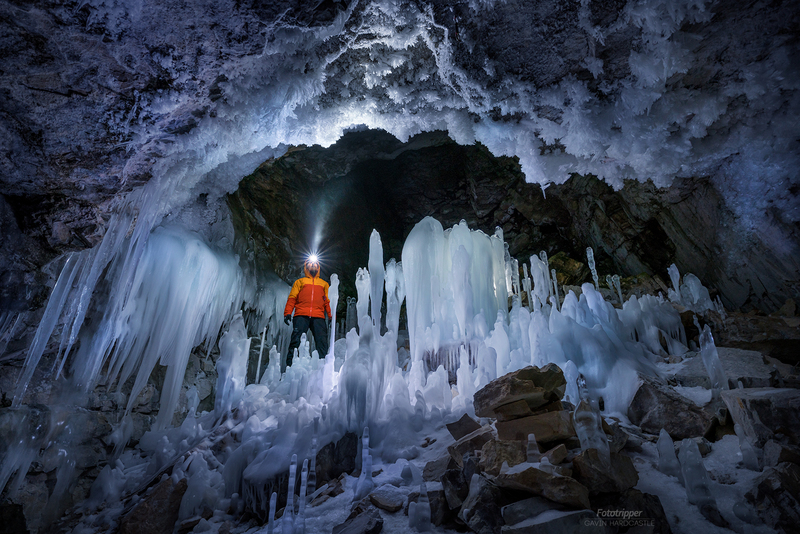 This ice cave in the East Kootenays of Canada was such a magical place that it wasn’t difficult to capture that magical mood with just one headlamp as a light source. We hiked through knee high snow in temperatures so cold that my 12″ sub actually froze solid. I still ate it but the extra crunchiness wasn’t that palatable. If we hadn’t been wearing foot warmers, hand warmers and serious winter gear things might have gotten a little dicey. The most important lesson that I learned while living in the Canadian Rockies was that you MUST respect the winter conditions. Being stuck in the middle of nowhere with a broken down car and no cell reception can be lethal. Whenever possible we would travel in two vehicles and always bring an alternative heat source. Like an idiot, I once stood in a freezing river at -25 Celcius while Brent looked on in horror. It wouldn’t have been that bad if I didn’t have a 20 minute hike through snow before getting back to the car. Needless to say, I came perilously close to frostbite and hypothermia. If the heater in my vehicle had failed I would have lost my toes at the very least. Lesson learned.